Confused on what bakeware set to buy? Then continue reading this article as we recommend five best bakeware sets for your consideration. All are selected based on their popularity, price, and features. Using a good bakeware set is as important as your baking skills to produce the best results. You should know what features to look for to get the best worth of your money. To get you started, check our product reviews along with some buying guidelines that you can follow. Just like any other cookware, the performance of your bakeware set relies on the material used. To get a better view of the different materials of bakeware, watch this video. Glass has a great heat conductivity and doesn't react with certain food. This makes this material a great food storage as well. It is ideal for baking puddings and casseroles. However, it tends to brown food with a lot of sugar and takes longer to heat up. Ceramic usually has an enamel finish, making it very easy to clean. It's safe on high temperatures and distribute heat evenly, like metal. However, like glass, it tends to burn food with a lot of sugar. Metal is ideal in baking dishes and pastries that require high heat, like cookies and biscuits. It can heat up faster and cook down quickly. Heat is also distributed evenly for better baking results. It's easier to clean if your bakeware set is made of nonstick material. The food easily glides from the surface leaving no traces of food residue. Just a simple wipe with a clean dishcloth is all you need. Ceramic bakeware usually has as enamel finish which aids with easy cleanup. For convenient cleaning, it is preferable that you look for a dishwasher-safe feature. This feature can save you the hassle of cleaning the bakeware pieces by your hands. The durability of bakeware sets may depend on the thickness of material. As possible, look for a heavy-gauge metal because it ensures a great resistance from dents and deformity. Among the best materials to look for include ceramic and metal. To protect your baked food from getting spilled on the floor, you need to look for a bakeware set with handles that can be comfortable to grip after cooking in the oven. Most bakeware sets provide silicone handles to make it easy to handle. The size of handles should be large enough so you can grab them easily. A warranty often indicates good quality because a manufacturer won't offer it if it doesn't trust its quality. The longer the warranty, the better. This comes in handy when you want your defective bakeware replaced for a good one. If you like an affordable bakeware set that can bake cakes and cookies with great confidence, then the Calphalon Non-Stick Bakeware Se﻿﻿t may suit your need. The bakeware set is made of a heavy-gauge carbon steel core that won't warp and a nonstick interior for easy food release. The toffee colored nonstick finish offers a nice and practical design. 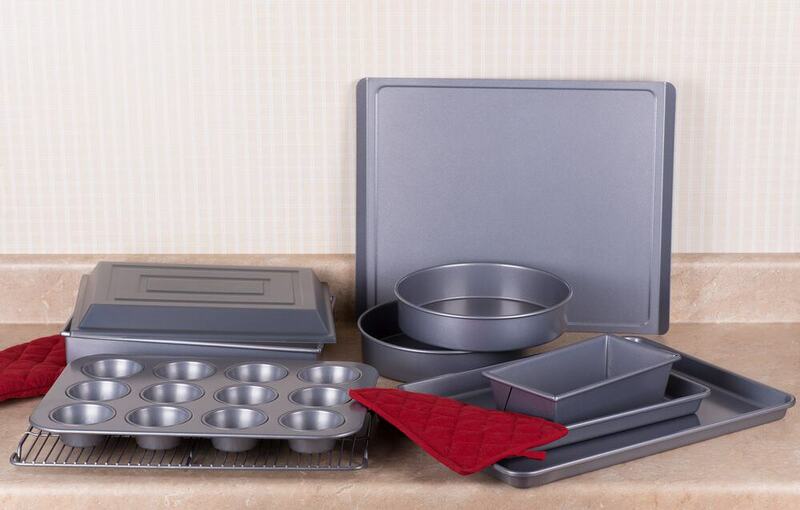 This 6-piece bakeware set includes all the necessary items from cake pan and loaf pan to muffin pan and cookie sheet. It promises to prevent over browning your food with its lighter color. It's dishwasher-safe for convenient cleanup and backed by a 10-year warranty. If you like a good looking bakeware set with all essential pans for roasting and baking, then you can try the Rachel Ray ﻿﻿﻿Cucina which comes in a latte brown color with agave blue handle grips. All the pieces are made of sturdy carbon steel and designed with rolled rim edges to prevent warping. Silicone grips provide a great amount of solid and comfortable grip. 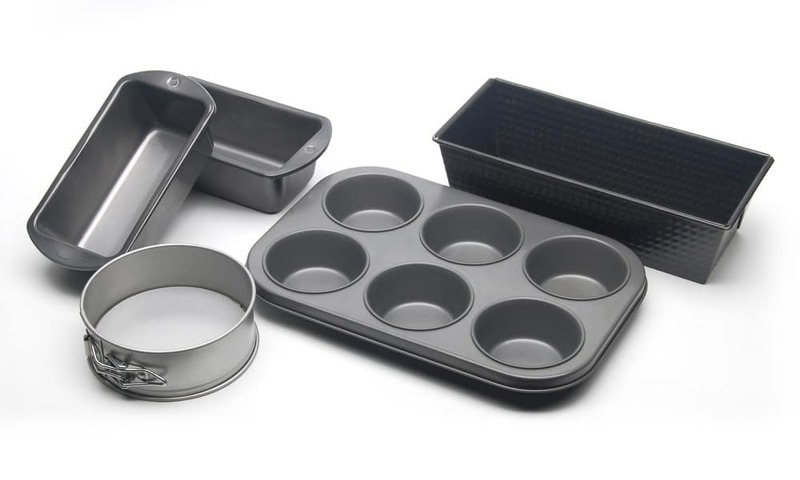 This 4-piece bakeware set includes a cookie pan, two round cake pans, and a muffin pan. The bakeware set can be placed in the oven up to 450 degrees Fahrenheit. Cleanup is easy with its latte-colored nonstick interior. Best of all its PFOA- and PTFE-free which means they don't impart any chemical residues to your food. You can put the cookware in the oven up to 500 degrees Fahrenheit and create a variety of roasted and baked recipes. Other pieces include pie plate and four rimmed custard cups. All pieces are made of nonporous glass that won't take up stains and odors. The Elite Bakeware Premium Bakeware Set is made of heavy duty steel to resist rust and prevent warping. The nonstick coating allows easy food release while the silicone handles have round ends for easy grabbing. This 5-piece bakeware set offers a wide array of baking essentials from two rectangle pans and square pan to circular pan and cupcake pan. All the pans are oven safe at a maximum temperature of 500 degrees Fahrenheit. For your peace of mind, a money back lifetime guarantee is provided. Among the five best bakeware sets reviewed above, it can be safe to say that the Calphalon Bakeware Set is the best among them all because it has most of the features that we're looking for. Calphalon Bakeware Set has almost all the baking essentials you need plus it comes with a 10-year warranty. All the bakeware pans are made of durable carbon steel construction and interlocking layers of nonstick coating interior. Have you bought a bakeware cookware set? Let us know your thoughts in the comments section below. Feel free to share this article if you want.